The Church Missionaries' Home was founded in 1850 for the reception of children of missionaries of the Church Mission Society (also known as the Church Missionary Society). In 1849, the Society's golden jubilee year, a special appeal was launched to finance commemorative projects, one of which was the establishing of a children's home. The following year, up to fifty children were accommodated in temporary premises at Milner Square, Islington, with a clergyman and his wife as superintendents. In October 1851, the Earl of Chichester laid the foundation stone for a permanent building at Highbury Grove, Islington, at its junction with Highbury New Park. The Earl also formally opened the Home in 1853. The new premises were intended to accommodate about 100 children, but had never satisfactorily provided for that number and, in 1883, tho committee were compelled to rent a house outside the Home. Enlargement of the existing building was considered but no extra land could be obtained and any extension would need to reduce the size of the Home's recreation ground, which was already too small. The Home had become considerably surrounded by buildings, and that the nearest children's playground was a mile away. Accordingly, it was decided to move the Home into the countryside. Fund-raising for the scheme was greatly boosted by a gift of £10,000 from Rev. F.E. Wigram and Mrs. Wigram. The sum of £14,322 was raised from subscribers, and Sir T. Fowell Buxton contributed £500. A 21-acre site was found on Wolf's Lane at Limpsfield in Surrey and on April 14th, 1886, Mrs. F. E. Wigram performed the ceremony of laying the foundation stone. 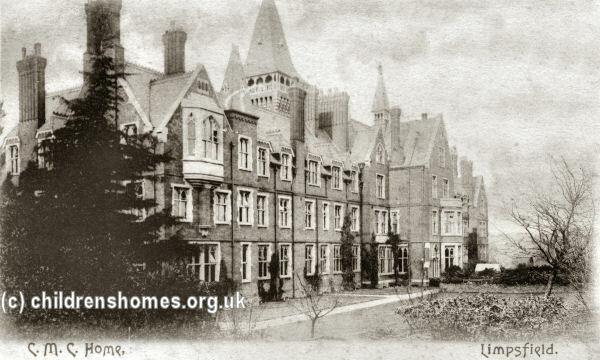 The new building, accommodating up to 120 children, was designed by John Norton in the then fashionable Gothic style. Construction was carried out by Messrs. E. Lawrence & Sons, of the City Road, with the cost being in the order of £32,000. The home accommodated boys between the ages of 4 to 15, and girls from 4 to 18 in case of girls. An outfit was required to be provided with each child at their admission, while the Home provided an outfit for those leaving. From the 1920s, the School — now known as St Michael's — began to broaden its intake. By 1941, the establishment had become St Michael's Boarding and Day School for Girls, together with a Preparatory School for Boys and a Kindergarten for Boys and Girls. As well as a swimming pool, the School could now boast of having specially constructed basement air raid shelters. The School building still stands but is believed to now be in private residential use. The Highbury Grove premises were subsequently used as a truant school and then an industrial school by the London School Board. Later known just as Highbury School, the building was demolished in the 1960s. Try Church Mission Society (UK).